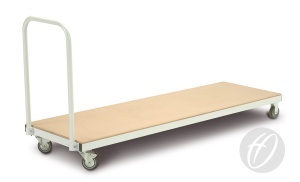 Heavy duty flat trolley ideal for transporting small mats through narrow corridors and doorways. Four non-marking 100mm castors, two swivel and two fixed wheels for stability. Slim design makes this trolley ideal for narrow corridors and doorways.